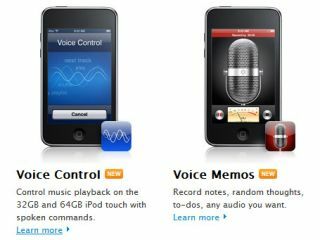 No video camera for the iPod touch this year - but it does get a new low price point and a top-end memory boost. The iPod touch 8GB will be sold at £149, starting today, with the 32GB version selling for £229. A new 64GB model will top the range at £299. There are no major overhauls to the touchscreen media player, although its ability to run OpenGL 2.0 suggests that it's had a processor overhaul to match the latest iPhone 3G S. The new iPod touch will come with the latest OS 3.1 pre-loaded, letting you enjoy features like Genius Mixes for never-ending themed playlists and the new iTunes LP format. It's a poor substitute for the nano's VGA video camera, but at least the touch does comes with the Apple Earphones with Remote and Mic (32GB and 64GB versions only). The microphone enables Voice Memos to preserve your nuggets of sonic wisdom, and Voice Control. This promises to let you simply say an artist's name to hear their music, as well controlling playback controls (including shuffle). Nike+ support is built in. "At just £149 the iPod touch is the most affordable gateway to Apple's revolutionary App Store with more than 75,000 applications that you can wirelessly download right into your iPod touch," said Philip Schiller, Apple's senior vice president of Worldwide Product Marketing. "You get a great iPod, a great pocket computer with the industry's best mobile web browser and a great game player, all in this super-thin beautiful enclosure." The new iPod touch should be available immediately.